Cherish Each Precious Day: Pumpkin Spice...Nice! Here I am today, with another creation made using the adorable new release Strawberry Jude Stamps set 'Falling with Fox & Raccoon'. What fun these little critters are, and oh my goodness, these stamps created such great, crisp images! First, the images were all stamped and colored with alcohol markers. The sentiment and mugs were stamped on a scrap of white card stock, and trimmed for a cute banner. After coloring everything, I fussy cut them, and added a bit of Glossy Accents to the mugs, eyes, and feet, and set aside to dry. I created the step card from white cardstock, and added some designer paper panels from some scraps. Added a couple of little hills along the bottom edge, again using some scraps. 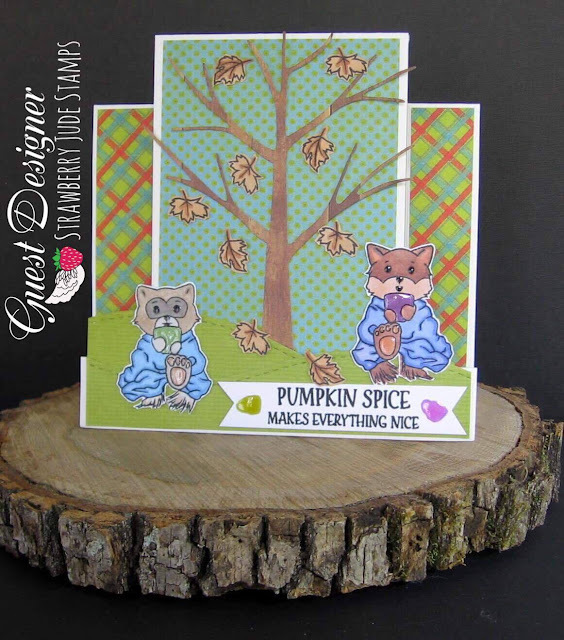 A tree die that I had in my stash seemed perfect for a background, and perfect for all of the falling leaves. Last, everything was adhered to the card using some glue dots and liquid glue. Thanks again to the crew at Strawberry Jude Stamps for having me as a guest designer this month. They were all warm, welcoming, and helpful, and I've so enjoyed working with this product! If you haven't gone to see their darling stamps, you should! This is just adorable Patti! So cute! LOVING the animals!!!!!!!!!!!!! What a darling card. I like the design of it. Those are cute images and I can even see the glossiness. Have a good weekend. Such a cute card design with those darling critters and all the papers and other embellishments you added. Hope you're having a wonderful weekend, my friend. I hope you're having a wonderful weekend, my friend. Awesome card! I'm amazed you could find so many beautifully coordinating scraps. They all look great together. And your little critters are so cute. This is just too cute - and again another style for me - love whimsy. The tree die is perfect.